Really good, I’m glad you teach about things like this. Yes, I agree completely! Very well written. Very thoughtful post. Thank you for exploring this. I am Cherokee and this is a very complex issue. Thank you for looking at so many sides of this for us. Hi DY, I’m glad you liked this one. It is indeed complex. Read it, and then read it again. Thank you, Kristen. I hope your readers like this. To say this is a complex issue is an understatement. Hatred and oppression still exist in so very many places, I wonder if humanity will figure out a way to survive in the long haul. One of your best. Brilliant! I am glad that I got to see your comment here. The quote of your friend made me aware of, well I’m not so brave enough to say yet, something from my past, a gift for noticing, no matter what. I feel horror, and shame, and an inner leap that I am not the only one to notice or to think like this, and the circumstances to allow it are not unique. There are some things that I have learned that other people don’t seem to want or nor are they able to handle. Thank you for sharing the story; that was very moving. My part in this story is now. At times it can be similar to events of the past. I think that it is what I choose to do with it that matters. To whom does it matter? Sometimes I know, sometimes I do not. As I speak to elders and attempt to maintain respect and traditions that are now said to be old, I think that I carry forward more than pain or negative spin and blame. I try to act in honor. Often I fail. I have seen that even a ‘card-carryin’ individual will hold more or less romantic ideas and ideals. These ideals come from many places, most of which are out of my control. People are more inclined to get upset over Haiti and injustices to ‘those’ people, they are prone to take action and to call that action compassion. People will read about deaths from lack and make themselves feel good to have done something, and yet will not even notice when the homeless person down the street vanishes, let alone decide to find out that he/she died from a lack of $10 to fill a simple antibiotic prescription. I do not understand it, and yet I know that I am blind to doing similar things. How does one learn which cause is ‘just’ and which one has value? Does altruism and group-think about such choices really work? oh shoot, I began commenting thinking that it seems so simple, the idea that “we will not regret the past, nor wish to shut the door upon it” and yet, who am I to choose for others to foist the concept onto them, I can only share about my own good days and my own bad days and remain teachable. Thank you for sharing all your thoughts above. I have been thinking about them for a couple days. I am particularly interested in the blindness to nearby suffering. How people decide when to give a damn and when not to is a very tricky question. Not sure that I understand it myself. I love the tone of your writing with the wry humour through out. It’s like most people around the world have actualy forgotten that the people native to America still actualy exist – until them come across some nice contemporary art created by them or something. I’m guilty of painting a romantasized version of them in the past as much as the next person though. In Manchester UK we have a magnificent exhibition of Native American costumes and tomahawkes etc but I don’t recal seing anything about the people in recent history apart from on TV shows – where they all own casinos of course. The romanticism is fascinating. I used to watch people come through the reservation on a kind of standard tour, meet all the right people and go home to write-up a polyana-narrative that had nothing to do with the actual lives of the people I worked with. Happened on a regular basis. I often feel like an anachronism. Perhaps there is some strange particle that hovers near us that immediately shifts any discussion of Indigenous issues into the past. Somehow I can be right here, yet all other Native people only exist in the past along with all of the issues we face. It is truly weird. What’s particularly troubling, to m anyway, is just how often that shift takes place in the comments of someone who seems to be in a supportive move, and how effectively it turns that support into a meaningless gesture. I’d been chris-crossing the Navajo Nation in the 4-corners area. 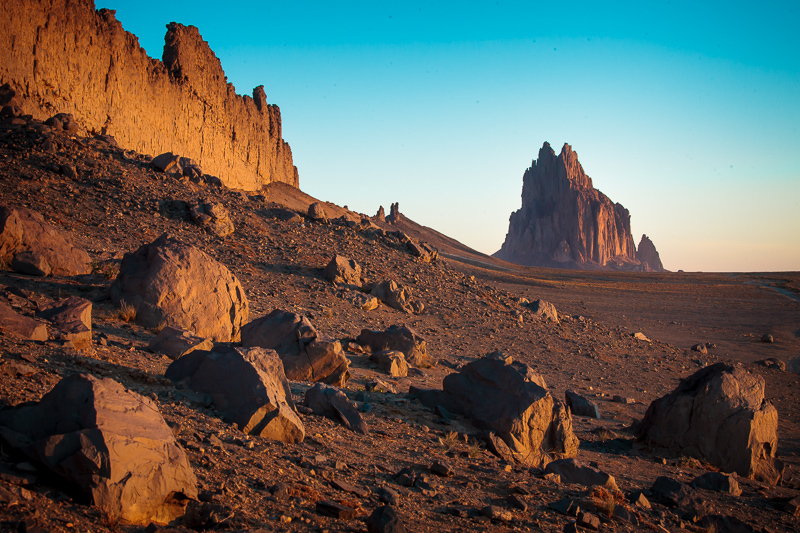 I went to Shiprock, New Mexico… the rock, not the town. No one lives there and I had scouted it out the previous evening for sunrise photography. In the morning I arrived about 45 minutes before sunrise to setup. I saw a car parked not far from where I planned to take pictures. The only people I ever encounter in isolated places like that before sunrise are other photographers. Shiprock is a famous photo site so I thought nothing of it. They came over to see what I was up to. All three of them were drunk as drunk could be at sunrise in the middle of absolute nowhere! I’d heard alcoholism was problematic on reservations, but this was my first confirmation. They were harmless, very friendly and quite interested in my camera equipment. The girl wanted to take pictures using my camera!! We compromised. I unsuccessfully attempted to help the girl click the shutter, then I took a picture of one of the guys with his dog. They then took off belching blue smoke out the tailpipe as they ambled off the 20 miles or so back to town. Is that how anglo-europeans have influenced Native American culture? This reminds me of the time when my neighbors came in a group to my door shouting about how my (biracial) children weren’t black enough because we didn’t eat fried chicken and watermelon. They also committed the horrid sin of disliking cornrows in their hair! Eeee Gads!!! Oh now that is terrible: I hope your kids are well past that sort of thinking. No, they still dislike cornrows BUT, they now also tell off the white girls (and some of the black, asian, and hispanic ones) to stop trying to get them to flat iron their hair. No one can ever seem to tell what they are. They look back with a deadpan expression and say, “I’m human, nice to meet you.” It’s hilarious! They can be walking anti-stereotypes, by their own choice, at times. I think they get it from their blue-eyed-ness. It would seem to be one of the narrative themes, unfortunately a common one. 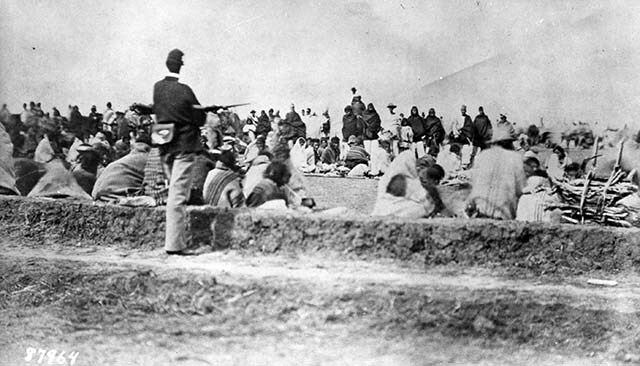 …worth noting that Native Americans also have a very high rate of complete tee-totallers. Problem drinking is common in native communities; so is total sobriety. What seems to be thin (if not entirely lacking) is the notion of responsible and/or social drinking that stops short of excess. We are all losing to this kind of disregard and will all benefit by facing this ongoing reality with collaborative restorative community justice… Much thanks again for raising a voice amidst the emotional land mine of a topic! I’m interested in First Nations issues in Canada, so this was a really good read. Thumbs up. Thank you; I’m glad you liked this. I love this! Great read. Hi – A very interesting piece – I spent thirty odd years building a life as part of a privileged ‘White Minority’ in a British colony. After Independence, I lost everything. Scrapping together what I could, I managed to buy a ticket for my wife and I to a UK I had visited years before as a teenager and where I knew no one, with only £200 ($300) in my pocket. This item brought it all into sharp focus for me. Do I qualify as having been on both sides? Thanks for stirring up the memories – times are better now and I wonder if this colours my feelings. Dang! What you said…I’d like to add the injustices that befell my Irish grandmother, born 1913, and what she did to survive, still makes my blood boil. Don diabhal leis na Breataine! However, in all fairness, if she hadn’t had the strength to survive and leave, I’d never have been born. Soooo…Don diabhal leis na Breataine anyway. And 2) I was 45 seconds into my first (and only) listening of “Accidental Racist” when I realized I was literally having a flight-or-fight panic response. I’ve heard similar remarks when people say,” you should just get over the memories of child abuse.” Time doesn’t always heal. Usually people remember and say only about genocide in Germany.